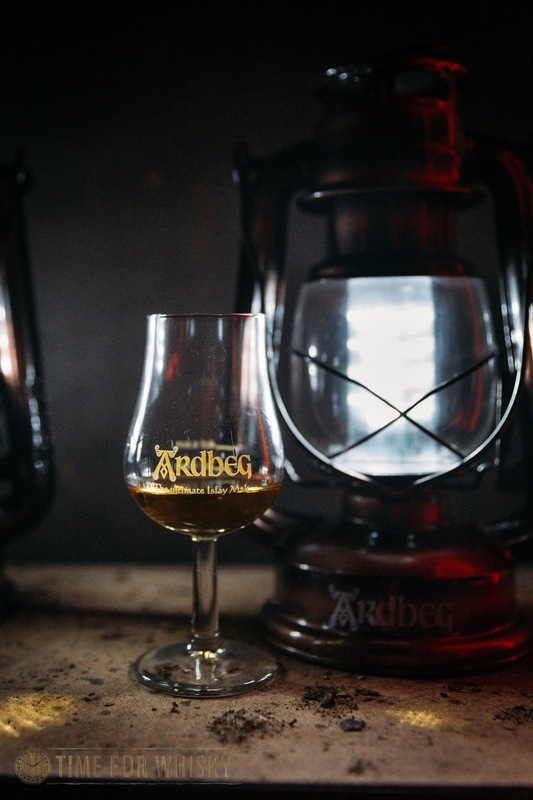 Inspired by the colour of the new Ardbeg release, this year's annual Ardbeg Day was flipped into a more fitting celebration - Ardbeg Night. 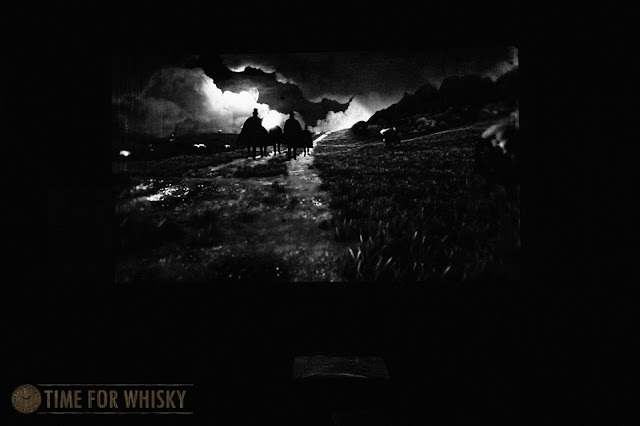 The notion of Ardbeg Night, other than to resemble the dark impression of the new Ardbeg "Dark Cove" release, was also to symbolise the gruelling tales from the 19th century when Ardbeg's Islay homeland was used by whisky smugglers as a notorious hideout. 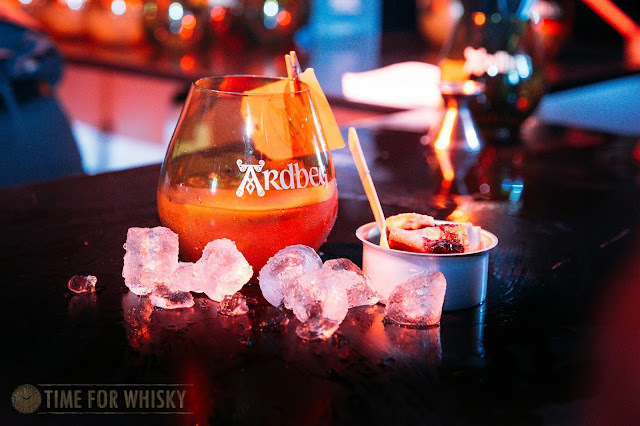 Prior to the founding of the Ardbeg Distillery by John McDougall, illicit whisky trade took place within caves and beaches around the site, hidden away from the island's excise officer. With the increasing popularity of Ardbeg Day over the years (last year Ardbeg Day saw over 15,000 people attend 135 events globally), this year, few lucky Ardbeggians who purchased the Ardbeg Dark Cove Committee Release between March and April 2016 were awarded with tickets to the Ardbeg Night celebrations (our friend Matt Wooler of Distant Thunder Whisky Club (DTWC) was even one of those lucky Ardbeggians). To complement the Committee Release, a regular "Dark Cove" release was also launched. The regular expression is cut at 46.5% ABV whilst its committee brethren is cut at a higher 55% ABV. See below for tasting notes on both, and here for Martin's earlier tasting notes on the Committee Release. The 2016 Ardbeg Night Sydney was held on 28 May 2016, coinciding with the final day of Feis Ile 2016. 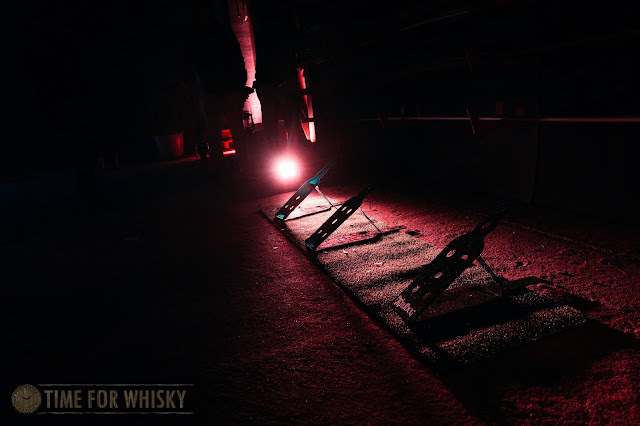 As Martin covered in the last post, the inaugural Hong Kong Ardbeg Night was held the night before at a venue known as "The Warehouse." 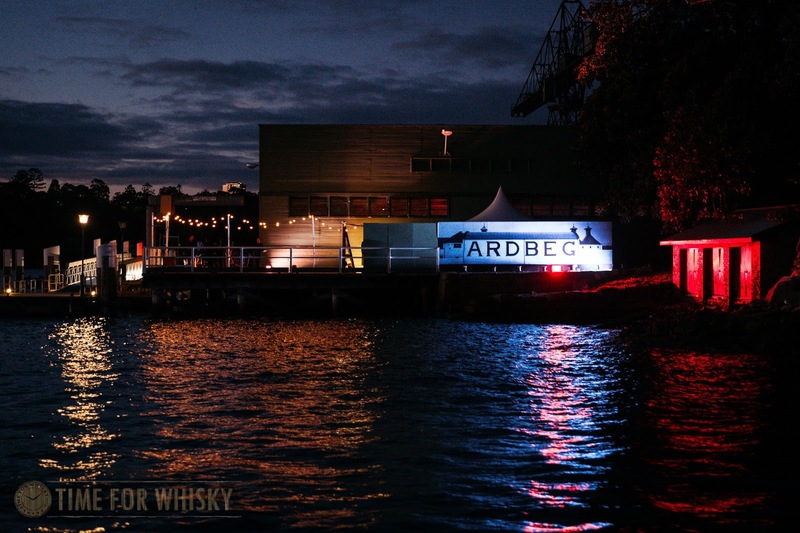 Although there was no mention of the new Ardbeg "Dark Cove" release, the night appeared to be a success. In Sydney, no details were provided ahead of the day, other than for us Ardbeggians to congregate at Millers Point wharf at a set time. Boarding the chartered ferry at Millers Point, none of us were told where we were headed. It wasn't until I opened Google Maps upon docking that I realised we'd all been taken to an island not far from Millers Point; Goat Island. The warehouse on Goat Island was lit with a giant Ardbeg display and the setup even gave Vivid Sydney a run for its money. Inside the warehouse, the atmosphere was "electrical". 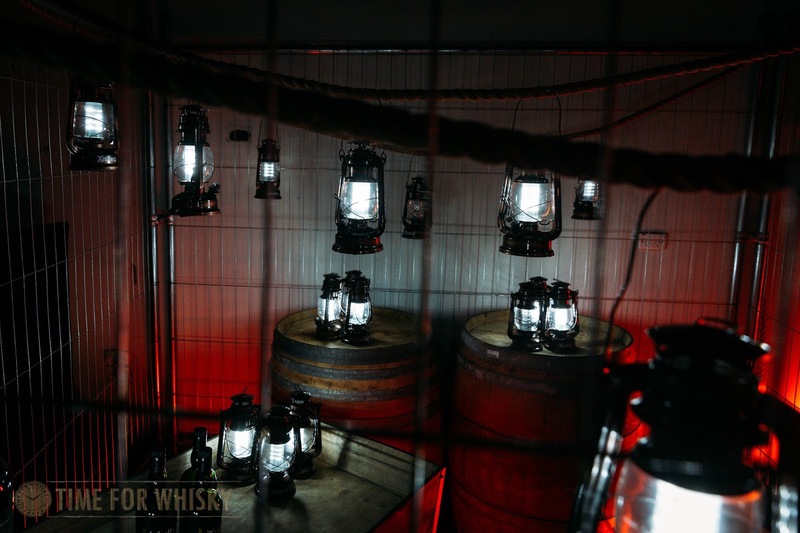 Old lanterns were scattered across the warehouse, giving it an eerie, dark and mysterious feel. The main bar was located at the centre of the warehouse and along the warehouse perimeter were activity stations where Ardbeggians could compete in everything from quoits to tug of war. The best part, (almost) everyone won. Some of the giveaways included Ardbeg umbrellas, Ardbeg beanies and a plush Shorties. Sadly, I only walked away with a beanie. All three cocktails were created by The Whisky Room and made good use of the classic Ardbeg 10yo as a base. The Lunar Eclipse was certainly refreshing. The others, sadly, I didn't get my hands on them though rumour has it that the favourite amongst the crowd was the Fashionable Smuggler. 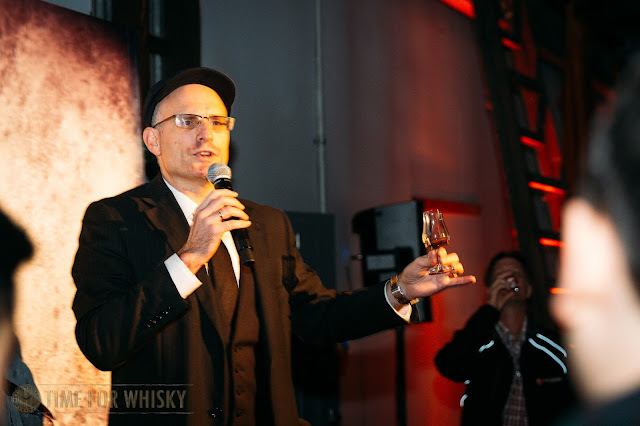 As with last year's Ardbeg Day, Andrew Derbidge of Whisky and Wisdom (and Cellarmaster of the SMWS) was the honorary guest that had been bestowed with the responsibility of unveiling the new Dark Cove. "Dark Cove" was described by Andrew as rich, filled with dark chocolate and cured ham. The general release of the expression was the one that had been previewed on the night with the Committee Release MIA. The expression saw maturation in both ex-bourbon and ex-dark sherry barrels. The darker appearance is what gives Dark Cove its name. Garth, the Ardbeg Ambassador was busy pouring out refills of the Dark Cove release (from a 4.5L Jeroboam) all night long. The Dark Cove release, to me, is one bold Ardbeg, punching the Ardbeg smoke yet showcasing other pleasant, fresh and crisp notes. This is an Ardbeg that you can love any day of the week. Nose: Rich, creamy, loads of raisins. The maritime note are subtle, so is the peat. The whiff is crisp and clean like fresh winter morning. Palate: Creamy and rich on the palate with summer berries, toffee, chocolate (chocolate berry tart?) coming through at first, followed by the Ardbeg campfire smoke; the peat. As the palate develops, it is then balanced with sweet peanut brittles and spices closely resembling nutmeg and cloves. Finish: Very long and smoky, ashy with fading maritime and spice notes. This fella sticks with you for a while. Rating (on Hendy's very non-scientific scale): 92/100 (not vastly different and the sherry influence does make this Dark Cove that extra bit special). Colour: The darkest Ardbeg ever? Darker than the current regular line-up, for sure, but not quite El Diablo territory, and not as dark as some recent SMWS bottlings. Deep amber. Nose: Rich, creamy peat....loads of peat. Coastal peat though - more maritime and less "campfire" than you may expect. Banana lollies and an overall freshness. At a guess I'd say there's a fair amount of youngish Ardbeg in here. Palate: Big, rich and chewy. Peaty caramels (now there's an idea)! There's definite sherry influence, with red berries and a hint of mocha, but also a younger, fresher, sweeter character - licorice allsorts, musk sticks. Loads of coastal peat throughout. Finish: Long and coastal-smoky. Fish nets, oysters, brine. With water comes a slightly earthier smoke. A hint of tannins at the end. Rating (on Martin's very non-scientific scale): 91/100. Another very enjoyable Ardbeg, one with a younger, stronger peat influence than some of the previous Ardbeg Day bottlings. 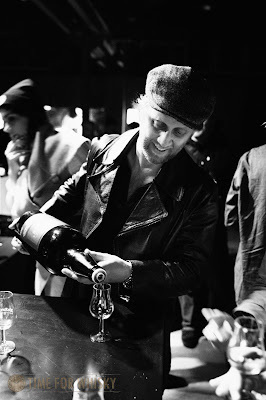 In comparison with the Committee Release, the General Release was equally as good though it did not punch as much sherry notes into you in the same way the Committee Release did. Nevertheless, in my view, the general release is equally a very nice and bold Ardbeg. Though given the choice and my preference for cask strength whiskies, I'd choose the Committee Release. Nose: Rich, creamy, fresh crisp morning maritime air. There is toffee, peppermint and raisins (though constrained). Palate: Similar to the Committee Release, the palate is creamy and rich, filled with child dark chocolate (the Lindt kind), jamón and sea salt. The Ardbeg campfire smoke; the peat is there and not over powering. As the palate develops, the grassy and peppery spices become more prominent. Finish: Long and smoky, the finish is dry (almost like dry wood chip smoke) and leaves quite a bit of tannin. With the excise men about to knock down our door, we'd like to take this opportunity to thank Ardbeg and the folks at EVH PR for their hospitality. Another year, another success. The Ardbeg Night theme was different, eccentric, yet brilliantly thought out. Most importantly the night brought all Australian Ardbeggians together to celebrate this ecciting new release. 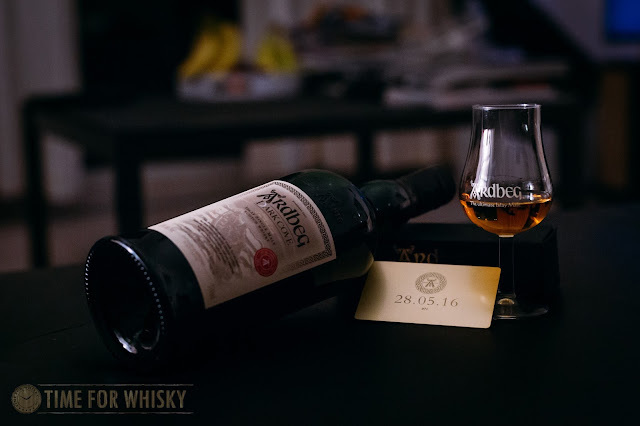 Until the next Ardbeg pour, Happy Ardbeg Day Night 2016!